Perdue answers questions on GIPSA, USDA staff and global trade. 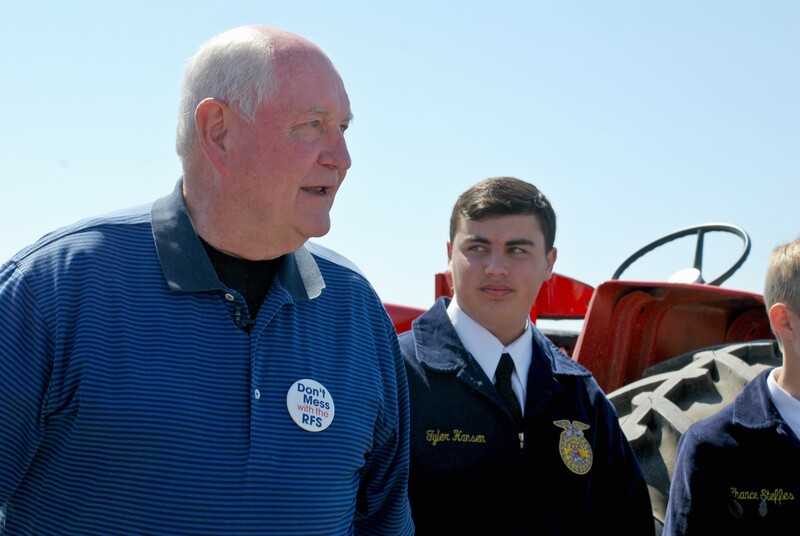 America’s farmers and ranchers waited the majority of President Trump’s first 100 days for Agriculture Secretary Sonny Perdue to be officially confirmed. So, two weeks on the job the questions along with the farmers greeted him at Crouser family farm near Nevada, Iowa. David Struthers, Iowa pork producer: You know as veterinarian what a foreign animal disease could do to the United States. If we were to get a disease something such as foot and mouth, it would not just hurt agriculture but the whole economy of the United States. I would encourage you to look at getting the vaccines we need and the capability to get those vaccines distributed. Perdue: Just the fear of that (FMD) can send shockwaves through the U.S. economy. We have seen an example of that in 2015 just with Avian Influenza. When I leave here, I am heading up the road to Ames to Animal and Plant Health Inspection Service facility- world class lab. I want to hear from those professionals, scientists and biologists on how we can be more prepared for any kind of threat. We have to understand that food-borne terrorism is possible and we have to be prepared. Austin Doty, Nevada FFA Officer: Do you plan on advancing renewable fuels technology? Perdue: Do you know who I work for? A fellow named Donald J. Trump. Did you hear what he said during the campaign? Renewable energy, ethanol is here to stay. We are going to look for new technology to be even more efficient. I look forward to giving the President better ideas. We are not going to mess with renewable fuel standards. Andrea Bachman, Export- Import Bank of U.S.: How can we be more competitive overseas? Perdue: The resources and funding are important in financing agriculture commodities, but there are barriers. We do not have as free and fair economy system around the world as we do here. We have to negotiate fairness. America’s farmers are not afraid of competition. We do not want barriers. We want to open those up because we are not afraid to compete. It is mostly about breaking down the tariffs. It has to be balanced. NAFTA has been great for agriculture but maybe not as great for manufacturing. We have to balance that out so American economy can thrive across the spectrum. NHF: What is next for GIPSA? Perdue: We extended the Grain Inspection, Packers & Stockyards Administration comment period, and I am trying to get up to speed on that issue. No one likes to be discriminated against. We have to very careful not to pick winners and losers in the market. We want our food supply chain to work together in healthy, commercial arrangement. I don’t like messing with commerce in a way that disrupts that supply chain. So, I cannot tell where we are going to come down on that, but GIPSA is important in our poultry, pork and beef. As you can imagine there are many different views in those areas, we are going to consider it very carefully. I told you we (USDA) are fact-based, data-driven decision makers. We are going to listen to everyone and hopefully come up with the best decision for all involved. Media: What is the goal for filling your remaining USDA staff positions? Perdue: Overall, the goal of a good leader is to get diversity across the board. Geographic, industry-wide, gender and racial diversity are important. I want USDA to look like America. I want to be the best and more effective managed agency, and that starts with good people. We are searching out for the cream of the crop across the United States for the right people.